Hispanic Heritage Month is a time to celebrate the rich culture – language, religion, food, music, and work ethic – shared by Latinos and Latinas all around the country. The Council is committed to recognizing the important contributions Latinos have made and continue to make to our country. 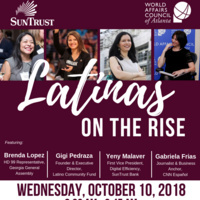 Our first edition of the Hispanic Heritage Month Breakfast Discussion will focus on the challenges that Latinas face in the workplace and the daily obstacles they overcome in order to succeed professionally, ensure a better future for their families, and contribute to their communities. Gabriela Frías, CNN in Español Anchor and Business Journalist, will moderate this discussion. This program was made possible thanks to the sole sponsorship of SunTrust Bank. By registering, I understand that photos and/or video will be taken at this program, and agree that these materials may be used for promotional purposes. Please contact the programming team with questions: info@wacatlanta.org.